Watching White Christmas while we decorate cookies is a family tradition that never fails to get me into the holiday spirit. It’s more than just the funny lines, the light-hearted romance, and the classic songs I love, though. For me it’s all about the cozy ski lodge called Columbia Inn. Sadly, the inn isn’t real. The exteriors and interiors were all created on the soundstage at Paramount. 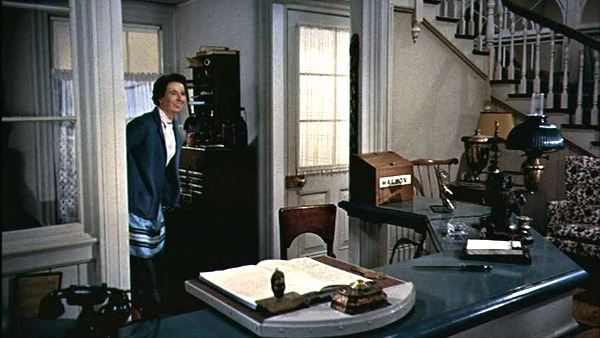 If I ever run an inn, my first priority will be to find a big-hearted, wise-cracking housekeeper like Mary Wickes who played Emma Allen. 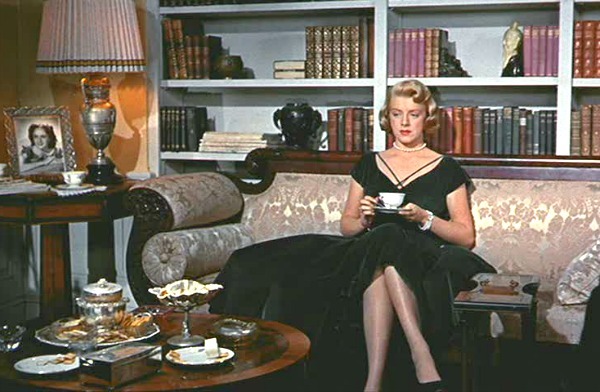 Rosemary Clooney was only 26 and her love interest, Bing Crosby, was 51 when they made the movie in 1954. Somehow I never really noticed the age difference when watching the movie. Dean Jagger, the actor who played General Waverly, was the same age as Crosby (51), but he’s treated like a much older man in the movie. 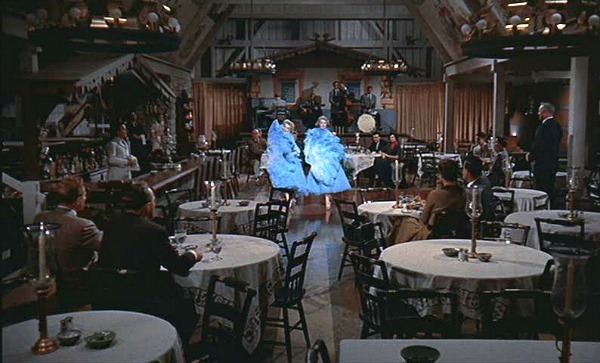 The barn beside the inn is actually a big dining room where Betty and Judy perform their famous number “Sisters.” Vera-Ellen was an amazing dancer, but she couldn’t sing. Her voice was dubbed in this movie by Trudy Stevens. In real life, Rosemary had been part of a sister act with her real-life sister Betty that started in Cincinnati. Vera-Ellen was born in Norwood, Ohio, a suburb of Cincinnati, and carpooled to dancing classes with Doris Day. That must have been some dance studio! White Christmas was intended to reunite Crosby and Fred Astaire, who had previously co-starred in the classic Holiday Inn that came out in 1942 (you can see my post about those sets here). This was considered a partial remake. Astaire turned the project down after reading the script, though, and Danny Kaye was given the part. 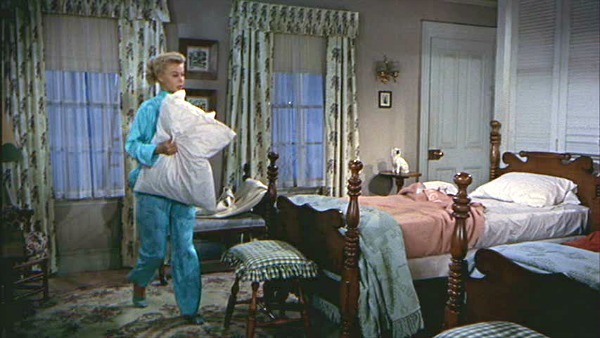 Vera-Ellen was 33 and 7 years older, but she played Betty’s little sister Judy. Or “her little chick” as she referred to herself. She reportedly suffered from anorexia, which is why she is wearing turtlenecks and some padding with all of her costumes in this film. 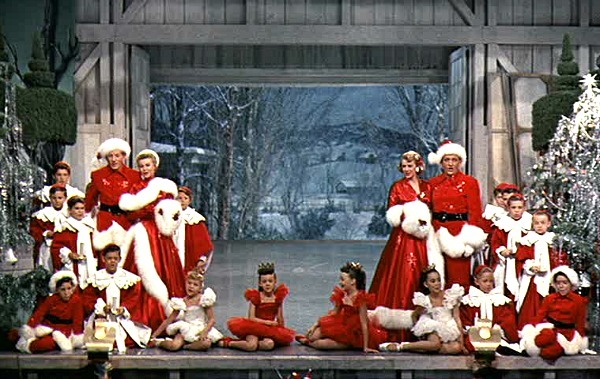 After White Christmas, Vera-Ellen only appeared in one more movie, 1957’s Let’s Be Happy, before retiring from the screen. She had crippling arthritis that made it difficult to dance when she got older, so she became a dance teacher. She died of cancer in 1981. Clooney had grown up listening to him singing on the radio and signed with Paramount because they promised her she’d get to work with him. After this movie, they became close friends. One of my favorite scenes is when Bob and Betty meet up in the dining room after hours and he sings “Count Your Blessings” to her by the fire. 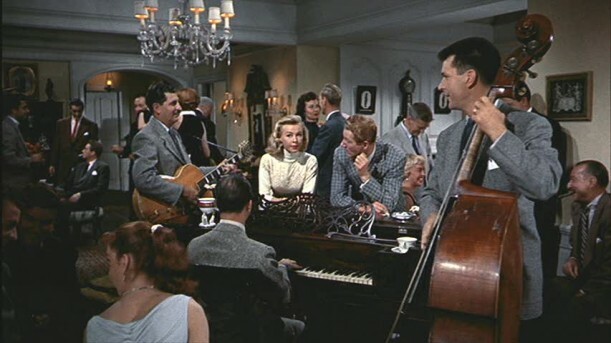 “Count Your Blessings” earned White Christmas an Academy Award nomination for Best Original Song. Clooney said Bing sang all the time throughout his daily life. If you visited him at his house, he’d be singing as he went up the stairs or walked down the hall. “He even sang on his bike. But he would sing parts of songs. The middle of a song, and then drop it,” she laughed. Back to the Inn…it’s the night of the big musical that Bob and Phil have put together in honor of General Waverly. Emma Allen has to convince her boss to wear his uniform. He doesn’t realize that they’ve invited his former unit to the show. 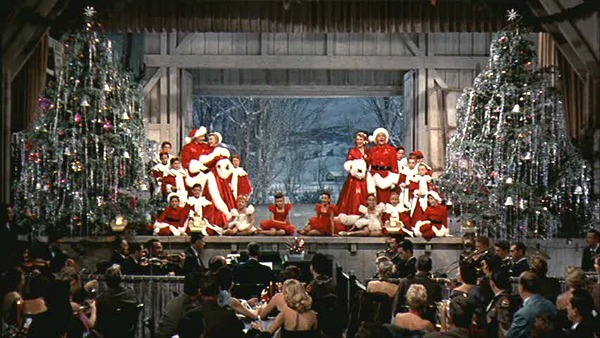 White Christmas was the first movie to be filmed in the new VistaVision process, with color by Technicolor. The General’s granddaughter Susan was played by Anne Whitfield. Can You Name These 10 Christmas-Movie Houses? Every year in junior and senior high, we’d be bussed uptown to see this movie. The theatre was so crowded, some of us had to sit on the steps in the balcony. Nobody was actually watching the movie. We were all talking and visiting. Once, I couldn’t find my bus for the ride home and I had to beg for a nickel to call my mom to come get me. I had the meanest bus driver, and he moved the bus from where he said he’d leave it. Anyway, I have never, ever seen this movie! All those years ago, I didn’t actually watch it, and I’ve never tuned in except for a few minutes every time I have turned it on. Since I like the looks of the room, I will have to check it out, but I really don’t think it can compare to Holiday Inn. I just found your blog through Sweet Something Design, which I found through houzz! I LOVE White Christmas. I used to watch it with my mom, and now that she’s gone, my husband graciously humors me. (My grown son started singing “Sisters” the other day–what a crack up!) So, I enjoyed this post tremendously– and learned a few things, too! I’m glad you enjoyed a White Christmas this year. We didn’t, but that was fine. Thanks for sharing. I hope you have a great New Year. Thanks so much for posting this! This is one of my favorite Christmas movies! I really enjoyed reading all the info that you added between pics. I have this movie on DVD, I’ll have to watch it with the commentary. And, I also always get teary-eyed at the finale. .-= Rhianna´s last blog ..Merry Christmas! =-. Thanks so much for this wonderful post! This is my favorite Christmas movie of all time (well, this and The Muppet Christmas Carol and It’s A Wonderful Life and…and…and….). I got teary eyed even seeing the screen shot of the snowy background! I loved the little tidbits of info you shared from Rosemary Clooney, too. Such fun insights. I just loved this post. Thanks! .-= Julie´s last blog .. =-. Anyway, thanks Julia for the amazing inside commentary, facts, and pictures about such a classic movie! Oh my – so much good information Julia! I just love this movie. Love all the same parts that you mention. The finale & the doors opening to snow is just magical. I’m singing right along too. In fact, my daughter asked me to be quiet a couple times – can you imagine? I never realized all the ages of the actors, & then relating to the parts they were playing. That was esp. interesting to read. Love that Bing Crosby. When I hear the intro to White Christmas on the radio, I just start to melt. Nobody can croon it like him. Do you remember his family Christmas shows? Those were great! .-= Sally´s last blog ..December 26th Pipe Dream =-. Oh I love this post!!!! I could watch that movie over and over and had NO idea Bing was that old in the movie. Wow!!!! Gosh he had the most beauitiful eyes (and darn good skin for a 50-year-old golfer!!!!) 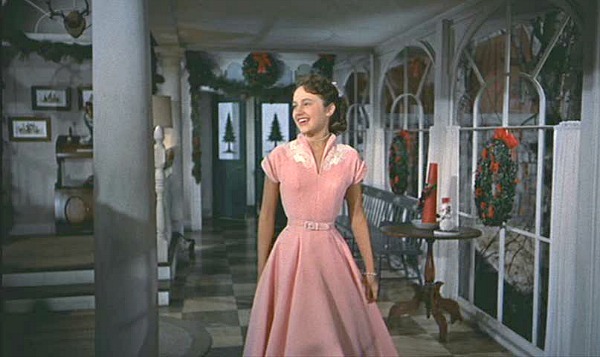 And BINGO on the dresses in the movie – those two of Rosemary’s and then the Christmas dresses at the end… sigh!!!!! .-= Lizzy´s last blog ..The One with the Drool =-. 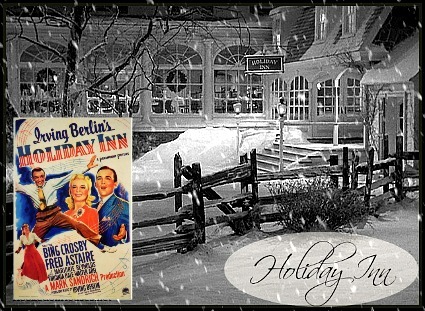 I loved the inn and made my own Columbia Inn sign- very much like the one in the movie. Still for sale in my Etsy shop! Thanks for posting this- loved Vera and her dancing- her legs were so thin I always wondered what her real age was when this was shot. Edith Head also worked for the NYC ballet company under George Balanchine and designed all of the incredible Nutcracker costumes! .-= Denise´s last blog ..Magic at the Mill =-. This was beautifully written. I’m so impressed with your research. You gave me so much new information about the film, and I enjoyed reading every single word of this post. I love White Christmas, and I’ll like watching it even more now. I’ve never been to Vermont, and every time I see this movie it makes me want to go there at Christmas. We didn’t have a white Christmas in Texas this year, but we did last year. Happy Holidays! .-= Michele´s last blog ..Merry Christmas! =-. Well, thank you very much for the wonderful synopsis of that classic movie. Haven’t seen it for years but next year I’d love to borrow your cookie making/movie watching tradition! I learned lots of things I didn’t know…like the age difference between Bing Crosby and Rosemary Clooney…it’s just something that never entered my mind. I’m disappointed that the Inn was “fake” but not entirely surprised. .-= CherylK´s last blog ..Snow Kiddingits cold! =-. Thanks for this post about White Christmas. I love, love, love this movie. I actually get teary eyed at the beginning of the movie when it’s the scene of the men in the war. I remember my dad telling me that when he was in the army overseas during WWII and at Christmas and to just hear Bing sing “I’m Dreaming Of A White Christmas” would make the men cry because they missed home so much. So of course I think about my own dad. Ditto on the dark blue velvet dress that Betty wears…I want that dress! And the black dress that Betty wears at her new gig in New York is gorgeous!!! Edith Head was a remarkable costume designer! I often wondered how Betty and Judy’s trunks with their blue dresses and the plums for their “sisters” number ever got to the Columbia Inn because Bob and Phil ran out on the Sheriff at Novella’s without any luggage and barely made on to the train in time. The train conductor is very familiar and I believe he has been on many films. 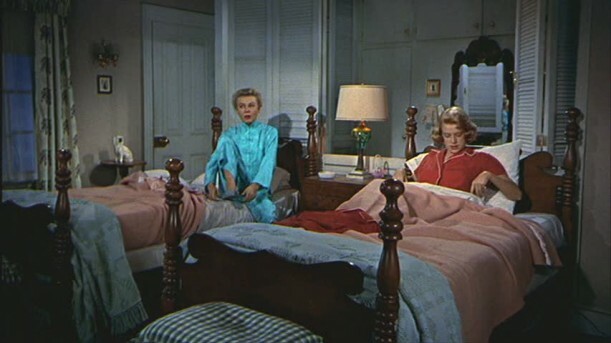 Love the dance scenes…and the scene where Betty and Judy are going to bed in their bungalow the beds look so comfy and cozy. Also, Mary Wickes who played Emma was also one of the old nuns in the movie “Sister Act”. She is a hoot! I can’t tell you how many times I watched this movie this season. I used to watch it every year with my mom and now that she is gone this movie is very special to me. Thank you for sharing this info. Julia, I am a fairly new follower. Thanks so much for your recent post on holiday movies. I managed to dvr quite a few of them and have really enjoyed watching them. I loved Christmas in Connecticut and Meet me in St. Louis. Shame on me for not ever having watched them before. You made my Christmas a lot more memorable this year for sure and I still have more to watch! 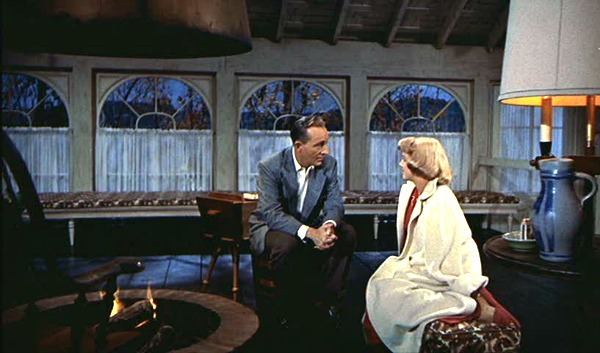 “White Christmas” is my gift wrap movie every Christmas, and like you, I can recite the whole thing by heart by now. It’s not Christmas without seeing it! It’s nice to know there are others out there who love it as much as I do. Thanks for this lovely post! .-= Diane´s last blog ..Ho ho ho =-. .-= Pamela´s last blog ..Snow =-. .-= Elaine´s last blog ..Merry Christmas! =-. That was so interesting. I love this movie…my father was a huge Bing fan all of his life and when this movie came out on video I bought a copy and gave it to him for Christmas….he got all choked up. His reaction was sweet and touching. My dad’s been gone for 14 years now and I always think of him when I watch this movie. By the way, supposedly Vera Ellen had the smallest waist in Hollywood….I believe it. I’ve never seen anyone with such a tiny waist. I read that Vera Ellen also lost a baby to SIDS and that was another reason she backed out of show-biz. How sad to go through that as well as to be suffering from anorexia. As a child, I always loved to see her dance in the film, but wondered why her legs were so skinny. My almost 3 year old even commented on it this year! .-= Amanda @ Serenity Now´s last blog ..You Better Watch Out- You Better Not Cry =-. I remember the first time I watched this movie with my daughter. She was about 5 and her face lit up and she sat through the whole things with her mouth open and clapped at the end. So it became a holiday tradition to watch this movie every year at Christmas. I remember buying it when it came out the first time on VHS! The “Sisters” and “Mandy” are our favorite music and dance numbers and we too wished the Columbia Inn really existed cause it looked so beautiful. As my daughter got older she always felt that Vera Allen looked “anorexic” but we still loved the movie, the music, the acting, the jokes, the dancing and the sets. You cried at the end? My Lord you’re as sentimental as I am. I cry a lot during these old movies, and guess what!! I’m a man!! Absolutely love “White Christmas”. Danny Kaye and Rosemary Clooney are my favorites. Can’t image Fred Astaire in the movie, though. Thanks for all the information! Julia thank you for bringinng back so many memories and special details. i have not watched this film in some time!! .-= Karena´s last blog ..Joyeaux Noel =-. This was so well done! Seriously, I loved reading everything, so much information, but the best part is knowing a little more about you. Thank you so much for your email! It was really sweet of you! I hope you’ve enjoyed every minute of your Christmas! Oh…my gosh..I’m so glad you did a feature on this movie. It is my most favorite Christmas movie. My sister and I would sing the sister song repeatedly during the holidays. Actually, she called me on the day before Xmas Eve singing this song to me. It was played repeatedly on AMC on Christmas Eve and I got to watch it three times. And loved it each time. There are so many moments I love in this film. When Bing sings “White Christmas” at the very beginning during the war with the music box. And I cry when they sing…”We’ll follow the Old Man”….I always have a lump in my throat then. And of course the blue dresses and “Sisters”. The dog faced boy. Mutual, I’m sure. Every bit of it…from beginning to end is my favorite. Thankyou for doing this post! I love the movie “White Christmas”. My family watches it every Christmas. Everytime I watch this movie, I can’t get over how beautiful the gowns are that the women wear, from the beginning all the way to the end. They don’t make dresses like them anymore. I also love the inn. I would love to go to a little town like that, and stay in an inn just like that one or open my own. I can’t believe that Bing was 51 when this movie was filmed. He looks like he’s in his late 30’s. I also thought Vera looked younger than Rosemary, but Rosemary was prettier. I love the old hollywood women beauty. They had this elegance that you don’t see in hollywood women today. I too get teary-eyed when they do the finale of the movie. 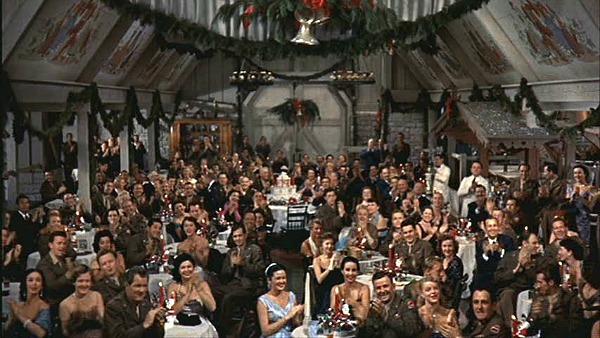 The ending is one of the best parts of the movie along with the scene where Bing Crosby sings “White Christmas” to the soldiers. They make me cry everytime. What a great post! I’ve always loved this movie and it stands the test of time. How great that you gave us some insight to the behind-the-scenes. .-= Becky´s last blog ..When God Closes a Door… =-. Thanks so much for the tour. I really loved that fireplace. Wonder how it worked without getting smoke all over the place? I loved that green velvet dress too and went so far as to find a vintage pattern to replicate it (but never did). Too many shedding pets! That was interesting about Vera-Ellen. Even as a kid I thought she had the skinniest legs I ever saw. If you ever open an inn in Vermont like that, I will be your first customer! This is not my favorite movie, but only because I love Holiday Inn so very, very much. 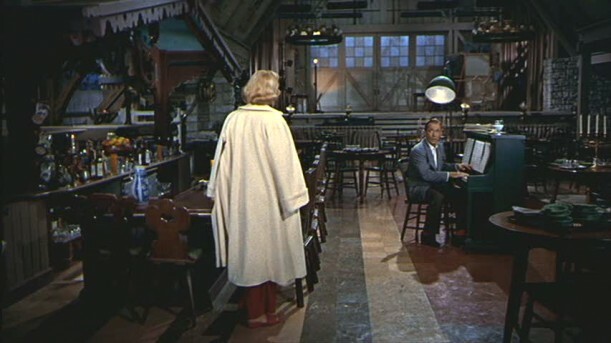 I think I read somewhere that part of the White Christmas set was originally used in Holiday Inn. If you look at the big arched windows it sure looks like the same set. Do you know if this is true? Have you done a post on Holiday Inn? If not, the sets are AMAZING. 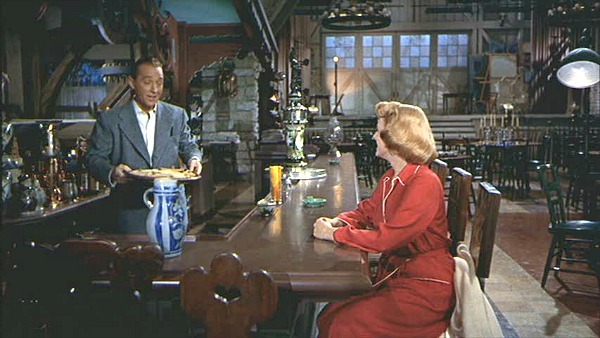 Plus, I really like where they are filming on the “duplicate” set that you get to see what the set actually looks like. .-= Mom in High Heels´s last blog ..Christmas Decor 2010 =-. Great post! I grew up watching this movie and it’s not Christmas until I see it…watched it 3 times this year. It’s one I never tire of and I always see something “new”. Thank you for all of the background info. Merry Christmas, Julia, and Happy New Year! What an absolutely beautiful post! 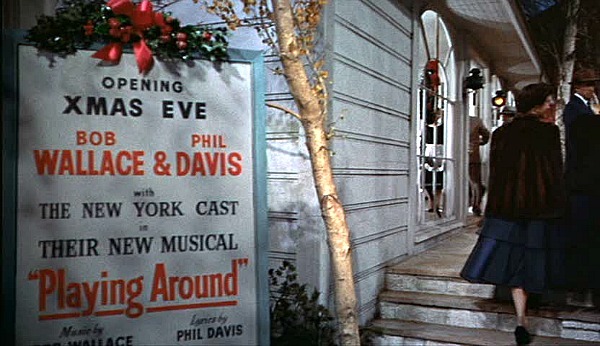 Believe it or not, I have not actually seen the entire movie, just snippets here and there, and I know that AMC had a White Christmas marathon, and I was fortunate to catch the part where Bing sang “Count Your Blessings.” Well, it’s still the holiday season, and it’s not to late to watch it, which I definitely will. One of your posters said the Christmas season went by so quickly, that she didn’t catch it, and I feel the same way! 🙁 I have two must-see Christmas movies: The Holiday and Little Women (1949 version) that I watch every season, but sadly, I didn’t this year. But as I said, it is the holidays until Jan. 1, so I still have time! I live in Boston, and we certainly got a white day-after Christmas, and will have a white New Year’s as well! Thanks for such a wonderful blog and Happy Holidays to you and your family. This is one of my Christmas Tradition movies too. Lovely post…we know the movie very well too in The Netherlands…I’ve known it since childhood….always want to watch when it is on…And am I THE Doris Day fan, so this fact about Vera-Ellen was nice new information for me. Thanks. .-= Ariadone´s last blog ..Winter Wonderland by Doris Day =-. Oh thank you so much for this post! I’ve never seen set shots, from this film. And who doesn’t love “White Christmas”? Plus, such kinds of sets are always the stars of a film, for me. Love sets! Love sets! Love sets! Especially in this type of film. .-= ‘Aunt Amelia’´s last blog ..Merry Christmas =-. .-= Maaike Quinn´s last blog ..I’ve done 31 BabySteps in 31 days and it feels great! =-. One of my family’s favorite movies, and we watch it several times a year, including the dog days of summer! Always enjoyable. I’m so ashamed to say that I’ve never seen White Christmas before. I promise to see it before New Year’s! .-= jennie w.´s last blog ..Don we now our gay apparel =-. ONE OF MY ALL TIME FAVORITES!!! So many one-liners that Bing and Danny throw out there. 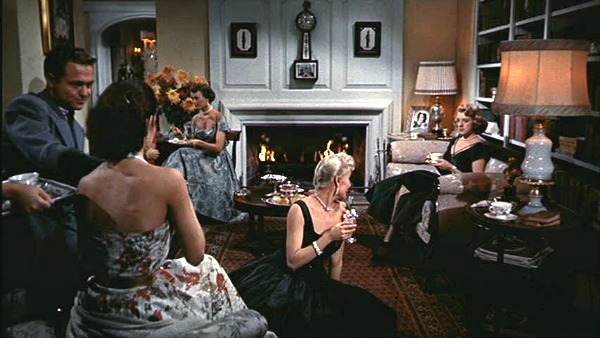 Rosemary’s dress at the piano party is my favorite! !…Edith Head was amazing!! 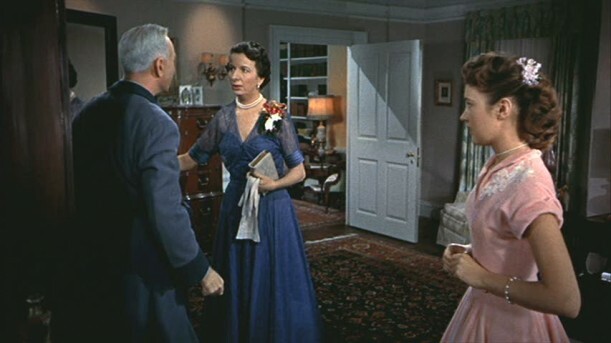 The age difference back then was never really noticed…Jesse Royce played Cary Grant’s mother in North by Northwest…they were same age. Cary Grant hooked up with Audrey, Bing with Grace in High Society (she was engaged to Ranier at the time…wore her real engagement ring instead of a prop because it did the trick! )…Rabbit trailing! The train conductor…I think he was the voice of Winnie the Pooh. 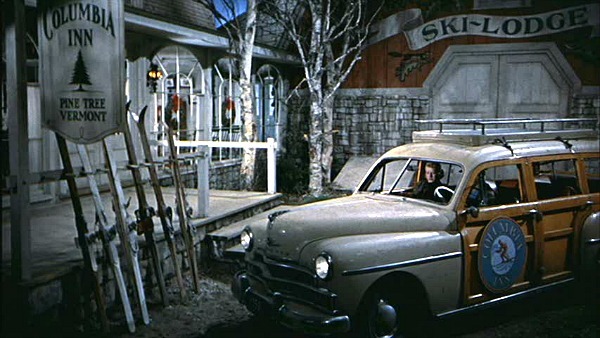 The set of White Christmas is cozy and they pulled it off…never think of it being a sound stage while watching. What a life it would be to run an inn in Pine Tree!! My mom was living at the Chi Omega house at the University of Texas in the ’50’s when Kathryn Grandstaff (a year older than mom and living at the ChiO house too) began dating Bing and he’d call on the one phone in the house and whoever would answer would yell…”Miss Grandstaff, Hollywood calling”! Thank you for doing an entry on White Christmas with some little known info included…very fun to read!!! One of my favorites! In fact a shot from the “Sisters” act is always my Facebook profile pic during Christmas. I have it on VHS and DVD but if it is on cable I will stop and watch it, even if it is halfway through. I always watch when putting up my Christmas tree. Inasmuch as I love newer Christmas classics like The Holiday and Love Actually, nothing tops the charm of White Christmas! Thanks for posting all the wonderful backstories! .-= Robin´s last blog ..Happy Boxing Day- grab a shovel =-. A great and interesting post as always. I love seeing these sets. They are gorgeous. I have to admit, though, that I’ve never seen the movie. Now I want to run out and rent it. .-= Lesley @ TheDesignFile´s last blog ..The Design Files top under-30 tips in 2010 =-. So much I want to say about this post. When my mother bought our first VCR the only tapes we had to watch were Ghostbusters and White Christmas. My brother and I watched WC 24/7/365 days a year it seems like for a few years. I remember my mother yelling up the stairs in July to turn WC off. I know this movie word by word. Vera probably helped me with an early distorted body image. I wanted to be that thin. Only a few years ago did it dawn on me to google her and find out that she did suffer from anorexia. Hence the turtlenecks to cover her neck. I always wanted a fire pit like that. But, can you imagine if they really did have those? What a hazard. You could fall right in! 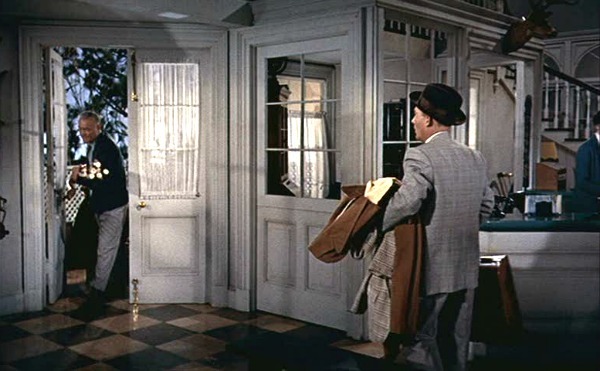 LOL Love those huge barn doors they open on Christmas eve for the snow scene. However, if they really did open those and it was that cold the whole room would have been so chilly. Don’t you love during hte movie how the General gets an important message in his ear? Like it’s a war move about to happen. Then we see him on the porch with the girls behind him looking at the snow. LOVE IT. Hilarious! And lastly the dress Rosemary has on in velvet. I have one very similar. It’s two sizes too small right now and it’s over ten years old. But, I can’t bring myself to part with it. It’s my dream to have a Christmas card with that dress on. Only I plan to be holding a martini and sitting on my loveseat near the Christmas tree and have my husband in the background taking care of the kids. LOL It’s not at all how our lives work in this house but I think it would be hilarious none the less. I love this movie and I adore this post! Such a beautiful film, the casting and costumes, it’s all so perfect. I love your butter cookie decorating tradition, what a great idea! “White Christmas” is such a classic film and song, one of my favorites 🙂 Sadly, we did not have a white Christmas. We were supposed to get snow yesterday and today and we got bupkis. I’m glad you got yours! .-= Bre´s last blog ..Black Swan =-. My family and I were watching this the other night and it was soooo beautiful and its so funny that you should touch on all these points about the characters because it was things that we were discussing!! Thank you for sharing! I’m going to call my mom and share with her all these facts! .-= Gina A.´s last blog ..DIY Project- Advent Calendar &amp Cans for Comments Update! =-. It wouldn’t be Christmas without this movie! I’m nuts for it! From the number of comments here, it’s “mutual, I’m sure”! I love, love love this movie. I remember that when I was a little girl I wanted to decorate my future home just like this lodge. Actually now that I think about it I wanted this lodge. I still like the mood of the set and adore the rounded Paladian type windows. My dream home will have windows like these. Thank you for all of your posts this year and Happy New Year. Thank you, thank you for posting this! White Christmas is my VERY favorite movie and I faithfully watch it every Christmas. Just watched the commentary the other night which is so interesting. Loved this! Your like a walking, talking house/movie set-ipedia..you know, like wikipedia! You have so much interesting information. I never gave a thought to the age difference between the actors..that’s really something. I love this movie more each time I see it. Guess what my grandson got me for Christmas? Mr. Blandings Builds his Dream House on DVD and original book writen by the man who actually built the house and after whom the movie was made. Love it! .-= Pat´s last blog ..After Christmas Thoughts… =-. 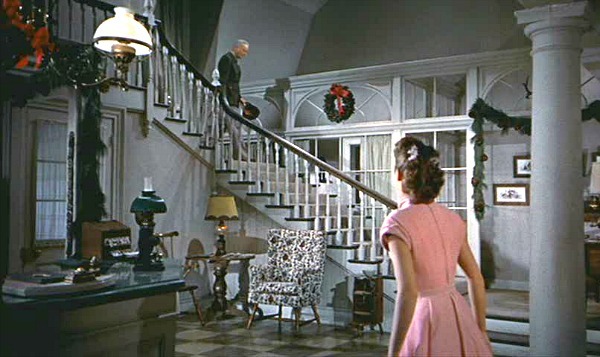 Thanks for the lovely blogging about “White Christmas”. It’s also a standing family tradition in our household. We even pull it out when we have the ‘summertime blahs’ in mid-July! And yes, for the first time in 91 years our part of the south had a genuine “White Christmas” with snow fall! Wishing you the happiest of New Years! Wow, Julia, some great insights I would never have known about this movie and cast! I really enjoyed it! Thanks and may health and happiness be yours in the coming year! P.S. If you ever do get that Inn that you desire, I’ll be sure to book a holiday with you! I love that gorgeous velvet dress, too. The neckline is simple, but very flattering. 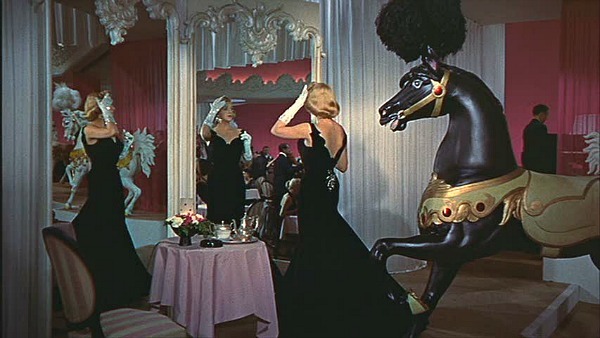 One of my all-time favorite movie dresses, though, is the stunning black one she wears at the Carousel Club. WOW!! And THANK YOU!! for confirming that the dancer (who I could never find a credit for) was, in fact, Bernardo! I’ve always thought so, but never known. 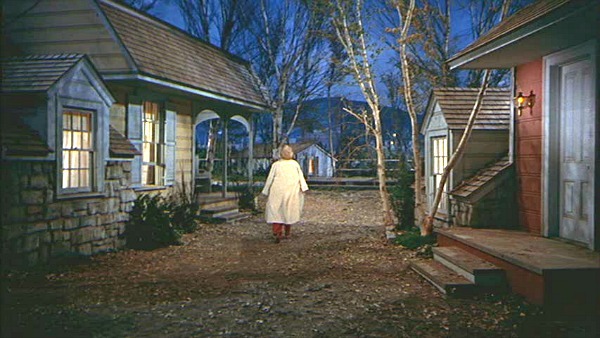 I’m glad you finally featured the inn from White Christmas. I’ve been thinking for a week that I needed to email to ask why you never have. What a wonderful posting about my all time favorite movie…that I am watching right now as I type this (when I should be writing!) My favorite dress of Rosemary’s is the black velvet one from the nightclub scene — would love to recreate it! Now I’m off to check out the rest of your site! I enjoyed reading through this. I too love this movie, have my own copy! I was always a fan of Danny Kaye, I thought he was so funny. I always choked up when the General finally comes into the room and all the other men in uniform are there, it’s a great moment. Rosemary Clooney was such an awesome singer and it goes without saying that Bing Crosby was too. They definitely threw away the molds with Rosemary, Bing and Danny…. .-= Liz´s last blog ..Upon Request =-. I love this movie and really loved your blog about it. .-= Kristen @ JoyfullyThriving´s last blog ..Holiday Swagbucks =-. Love this movie – thanks for all the back info. Interesting about the ages and I always wondered if Vera Allen was anorexic! Sorry it’s not a real inn. As much as I love White Christmas, Holiday Inn is my favorite! And Yes – we had a white Christmas in Georgia! Thank you so much for this post. I live in Georgia, in the foothills of the Blue Ridge, and the only snow we ever get is maybe a little dusting and never on Christmas. I always watch this movie and dream about actual snow on Christmas morning. This year I have been out of work and so we didn’t have money for presents. I ended up having to make all my gifts this year. I was pretty down about the whole thing and then on Christmas morning the snow started coming down. We ended up with about five inches! My husband kept singing “White Christmas.” It was truly the best Christmas ever. 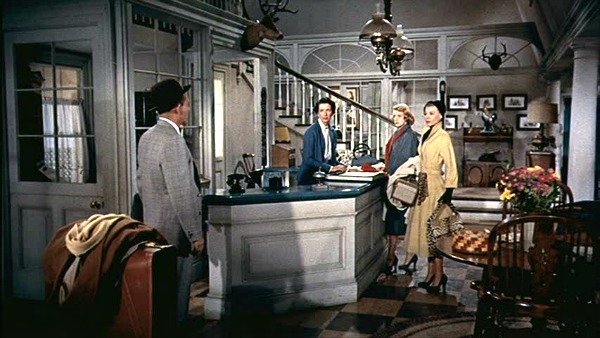 THANK YOU for this awesome trip — I adore this movie, and always wish I could book a night or two at this gorgeous Inn. Wouldn’t it be the BEST if some investors could recreate this place?? I had my white Christmas also, and after the blizzard, I’m still putting the lights on. They look great with the snow-cover. What a wonderful post, Julia. When we were kids, my sister and I watched White Christmas every time it was on TV and loved it. We still watch it to this day. Several years ago, the “Sisters” act was performed, in costume, at our church festival by one of our priests and a male parishoner. It was one of the funniest things I’ve ever seen. And me . . . . I knew every word of the song. Ohh, this is one of my all-time favorite movies! I stayed with a friend for a week before coming home for Christmas this year, and we watched this movie every single night the entire time I was there. Love the songs, the costumes – oh the COSTUMES!, the cheesy period dialogue, the dancing, and of course the sets…I always get goosebumps at the end when the barndoor opens up! Love love love this movie. P.S. Love your Movie Mondays – I have gone out of my way to watch at LEAST 3 movies you’ve featured on here! Most recently was “Its Complicated” – the movie was funnier than I expected and I droooooled over her kitchen! Thank you for posting this! White Christmas is one of my favorites (of course) and it always makes me want to learn to tap dance too. 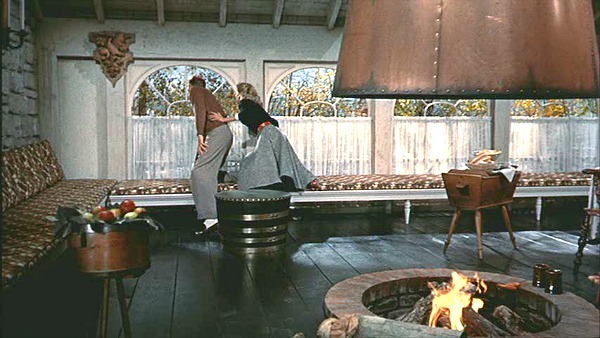 Don’t you just wish you had a round fireplace like the one featured in the scene with the butter milk? .-= Amy from China Shepherdess´s last blog ..Merry Christmas from my little house to yours =-. This post reminded me of “Newhart”, the sitcom starring Bob Newhart as a Vermont Innkeeper. I haven’t seen this movie, but I just added to my queue from the library 🙂 I’m excited to add it to my ritual of holiday movies at this time of year! .-= Tiffany´s last blog ..So-Pretty Candy Apple Treats =-. This post is so good Julia…I wish I had seen it at or before Christmas! Now I’m all in a Christmassey mood and it’s New Years Day (Happy New Year by the way!). We were so busy this year during the holidays that I didn’t to many of my favorite movies…this being one of them. I’m nursing a cold right now and W. C. would be a perfect tonic. Again, such a great post…I liked learning the little extra tidbits about the actors. Hey Julia–I didn’t spend much time on the computer while the kids were out of school, and I missed this post of yours. Oh! It sounds as if you and I must be “Sisters.” Really, with the red hair, we could be, right? I’d have to be Betty and you’d have to be Judy, since I really am older than you. I dearly love this movie, and the Pine Tree Inn has always been my favorite part of it. Years ago–maybe on the 50th anniversary of the film?–my husband bought me a gift set that included a copy of Rosemary Clooney’s script. It’s wonderful! So many of the lines are close but not exactly the same as in the movie–it’s obvious from reading the script that a good deal of ad-libbing went on. But when you have folks as brilliant as Danny Kaye and Bing Crosby in the cast, I guess some ad-libbing is to be expected! I hope your 2011 is wonderful! .-= Richella at Imparting Grace´s last blog ..For Edie =-. Hello, my mom is Anne Whitfield who plays Susan Waverly. She is retired from acting and now runs a quaint bed and breakfast in the Seattle area. She doesn’t like to talk much about her acting days, but I wanted to share with her the lovely comments you all share about White Christmas. By the way, Julie, please share with your mother that this last year, I had the pleasure of introducing this movie at the 500-seat classic movie palace, The Dryden, at George Eastman House in Rochester, NY. Many patrons commented on your mother’s subtle, affecting performance, particularly the moment when she sees her “grandfather” attired in his general’s uniform. It’s a moment that chokes me up, annually, and many folks I spoke with said the same. The usual comment was something along the lines of: “That girl is so lovely, you can tell her character almost immediately, in spite of her not having many lines at all!” Please give her a big “thank you” from all her fans in Rochester, NY! LLLLLOOOOVVVEEE IT!!! Can’t say anything more…one of my very favorite holiday movies! I adore all these beautiful, light hearted movies from earlier times. Sweet perfection! 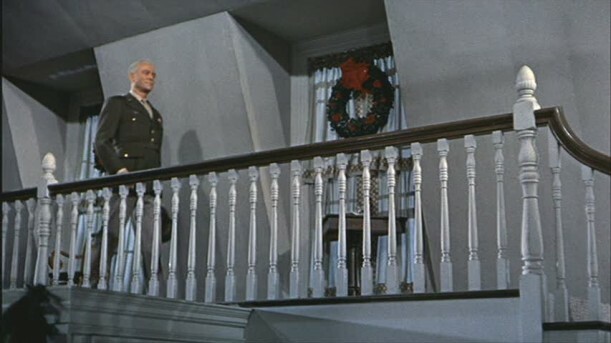 White Christmas is my all time favorite Christmas movie and you got some excellent shots so Thank You!!! I love all the interestings facts too! Count Your Blessings is one of my favorite numbers in the film and I never knew it was Oscar nominated; I’m so glad cuz it’s always seemed so underrated to me. Of course my sisters and I use to do the Sisters number lol. I would not have guessed that Vera’s voice was dubbed, but I’m glad they used her because she’s such an amazing dancer. I have definite dancer’s envy. One of the most fascinating things is all of their ages. I wouldn’t have guessed Rosemary was only 26! I thought she was like 40 and Vera looks much younger than her. And I would have guessed the General was at least 10 years older than Bing. I love this movie like an old friend, and have watched it more times than I can count. 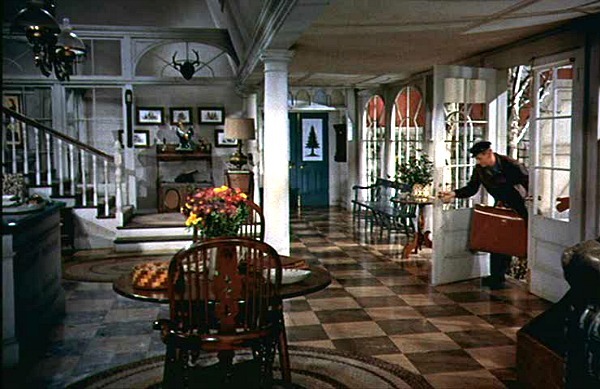 The sets remind me of the Ethan Allen colonial-style interiors that my parents tried to replicate when I was a kid. Did you ever notice that the movie begins during a war, with a nostalgic backdrop of New England, and ends in New England with a nostalgic look at war? It comes full circle. I cry at the end when the audience start to sing along because they remind me so much of my parents and their friends, just starting out together and feeling blessed to be alive. Oh no, I haven’t watched it since December! Better go dust off the DVD. . .
What a wonderful post.The best movie ever produced for the best song ever written. I stumbled on this site looking for a Columbia Inn Pine Tree Vermont sign which I found and purchased.I watch this movie several times during the holiday season and sometimes well after. This movie has it all song,dance,romance and the sets are spectacular.I watch this movie when I,m wrapping gifts and decorating our tree.I hope everyone gets a chance to see this movie and[Count Your Blessings]. I,m also glad to see such interest in this wonderful movie .If this movie doesn’t get you in the Christmas spirit and appreciating life you haven’t got a pulse!! THANKS AGAIN Jimmy C.
I love your blog! We seem to adore the same old movies. 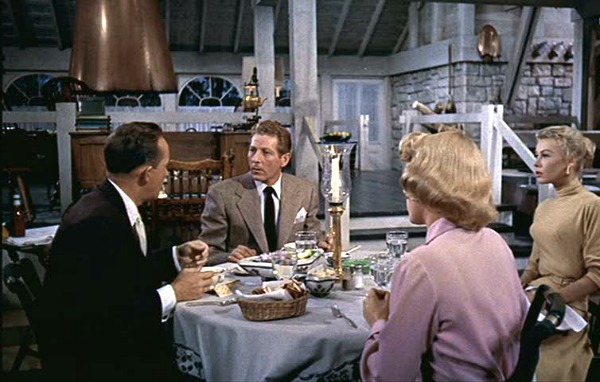 I’d love to see a post on the inn in “Holiday Inn”. Love your blog. This is my favorite Christmas movie. Found you while searching for pictures for my White Christmas in July blog party. You have done a wonderful job with this post, including all those details. I added your link to my party post. I look forward to visiting since I love old movies and houses too. This is a fabulous article on the making of the film, and I loved your shots of the costumes as well. The granddaughter had such a cute wardrobe, though I think Vera Ellen’s was my favorite. Thanks for writing this up so well! What a lovely webpage! Thank you for your time and effort. And may you have another White Christmas! 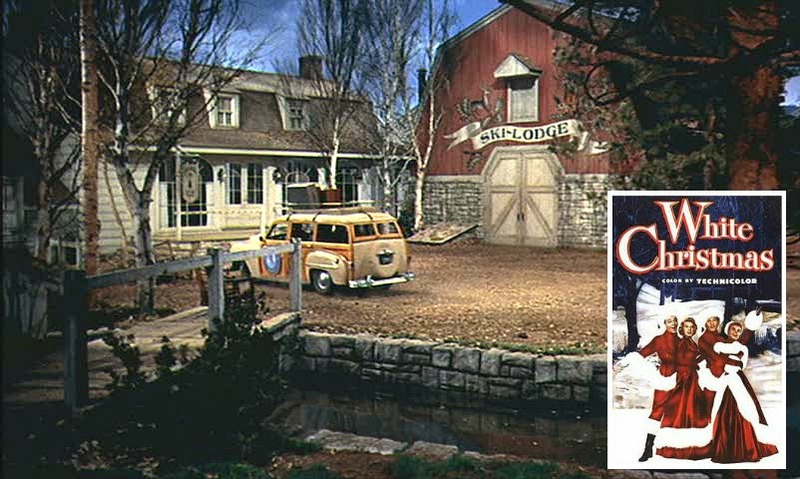 called The Village Inn and some of the outside scenes were filmed there. Funny you should mention “Holiday Inn,” Pat, because I just finished writing a post about it and will be publishing it soon. I love that one, too! Thank you for putting this together. White Christmas is my favorite holiday movie. I get teary-eyed too, every year I watch this! 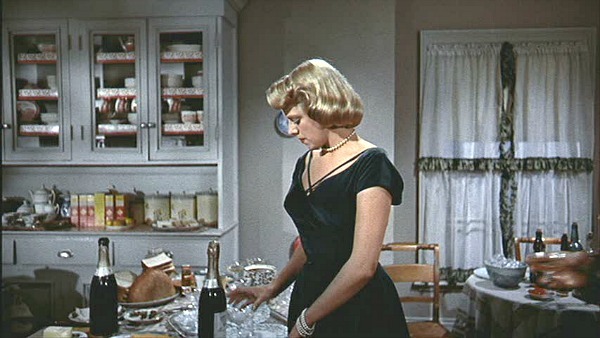 I loved your take on this film…I just finished up my blog post on Vera-Ellen’s scene-stealing turn as the darling younger sister “Judy” (although she was older than Rosemary Clooney by several years!!). Here it is, for your enjoyment and for the enjoyment of your readers….a little visit to Columbia Inn with one of the Haynes sisters! We love this movie and have always wondered what the song is that Phil wrote for him and Bob to do when they get out of the army. Thank you for your research and time putting this together. What a great movie! I’ve always wanted to recreate the “Inn” in a private home building project. Wouldn’t it make a wonderful home……..
Glad to see I’m not alone here with my admiration for your work on the article, screenshots, and your research of this movie. This is also my absolute favourite Christmas move. 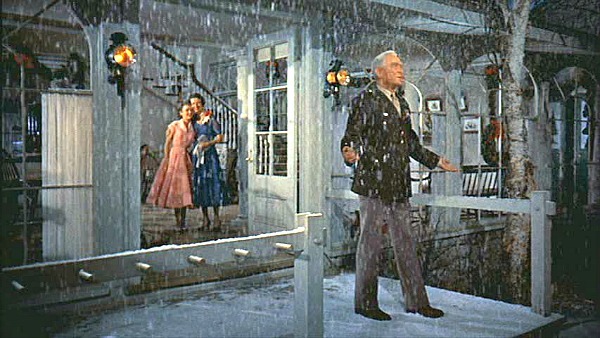 For the record, I tear up when Bing sings White Christmas at the BEGINNING of the movie and the waterworks go pretty much through the whole thing! 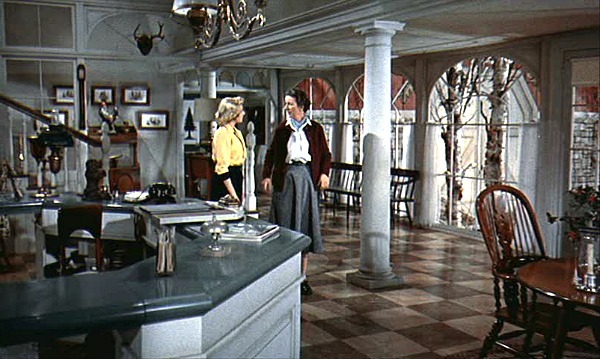 After seeing both Holiday Inn and White Christmas, I want to live in that inn! Now, I’m off to watch the film again! Im always hoping that somewhere out there in hollywood there is still one heart that is not tainted with modern values,that could find one more Holiday Inn, Its a Wonderful Life, White Christmas ,Good Sam, or Christmas Story. Maybe thats why we all still watch these great classics ,because they were made by people that were for the most part in real life like the characters they play. Thank you for your web site.